Lecrae understands that he cannot single-handedly stop the racist movement that took place at the University of Virginia, last week, but that isn't stopping the rapper from using his platform to make some change in Charlottesville, Virginia. On August 12, white supremacists and neo-natzis gathered in Charlotesville for what they called the "Unite the Right" rally in order to protest the removal of the Robert E. Lee confederate statue. Amid chants of "white lives matter" from white nationalists attending UVA and non-students, counter-protesters were also on the scene which led to national coverage of overt racism and violence. Tensions escalated when James Alex Fields Jr. drove his vehicle into a number of counter-protesters which killed one woman and injured over a dozen others. The events angered many, including 37-year-old Grammy winning rapper Lecrae who has spoken out against racial injustices for years. "I was pissed at the audacity where people would feel like they could just storm a campus in protest with that type of visceral hatred," he said in a Vibe report. "They didn't even wear masks. They just said, 'I'm here to hate and I'm going to go back to work this week,' and that's a scary thing to have to encounter." The "Blessings" rapper took to Twitter on August 12 to offer help to any students at the University of Virginia who wanted help transferring to another school. "If anyone feels unsafe at UVA and needs help to transfer schools let me know," he tweeted. While a handful of students responded to his offer, Lecrae said three black women who attend the university went through with completing the paperwork to switch schools for their safety. Faculty and staff in other schools helped the rapper in his efforts to facilitate the transfers for students who felt unsafe. "I was very grateful for some other faculty and local people who worked at colleges who could do more of the heavy lifting,"
Despite his efforts, Lecrae admitted to feeling helpless when racial issues rise up around the country that he calls home. "After Ferguson, Baltimore and all the shootings, you find yourself helpless in so many ways," he said. "I don't feel like I can tear down these systems of oppression or hatred, but what I can do is liberate people who are victims of it." In a previous interview with The Atlantic, the rapper and mogul spoke about the importance of Christians speaking up about social issues. "Christians need to embrace that there need to be believers talking about love and social issues and all other aspects of life," he said. 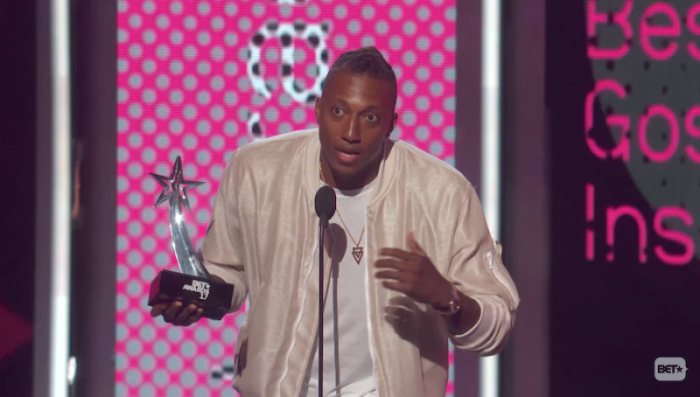 When speaking about the incident in Virginia, Lecrae stressed the importance of people coming together to form a united front against racism. "People have got to form some kind of unified fronts where you know who your allies are, you know who your friends are, and really begin to work together to create different kinds of infrastructures to protect one another and to help one another thrive," Lecrae told Vibe. "You know some of those guys who were out there with torches and guns and vests are their bankers ... they could be their doctors and physicians. So you have to create a whole new network of individuals you know are allies and who can protect you and mean you no harm."